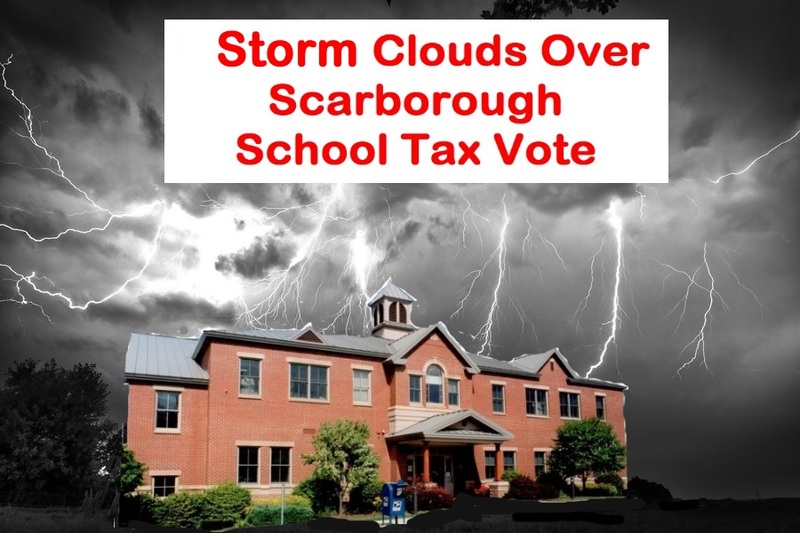 Storm Clouds Over June 13 Scarborough School Tax Vote | Look Out Scarborough! Well, folks, here we are again near the end of Phase One of the annual school budget referendum conversation. A school tax increase that town officials had hoped to slide through quietly under a disingenuous slogan (“One Town, One Budget”) has become a topic of intense and informed discussion – the absolute last thing they wanted. And the more people who understand what’s really going on, the less likely the prospect of passing the 7.4% increase in school taxes called for by the school budget. The only thing on the “School Budget Referendum” ballot is the school budget. We are NOT voting on the municipal or county budgets, which are separate components of our tax bills. As we pointed out in our last post, the school budget we are voting on raises $42.8 million of tax dollars for the schools – an increase of $2.9 million or 7.4% over last year. 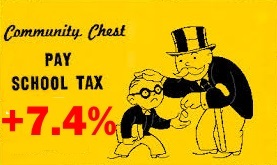 If you believe a 7.4% increase in taxes for the schools is too much, vote NO. This is the only opportunity you get all year to vote directly on your taxes. Please take advantage of it! 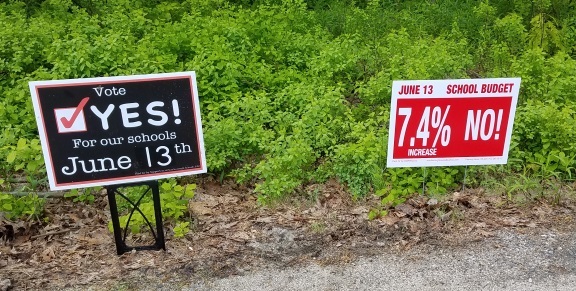 Apparently the lawn signs used in the school budget referendum have generated some controversy. Especially the VOTE NO signs. Those signs have the audacity to cite the actual increase percentage of school taxes to be raised if the school budget is approved. Imagine that… highlighting the increase in taxes of the budget we’re voting on – the school budget! And yet somehow this is misleading???? The transgression of the makers of the VOTE NO signs was that they failed to go along with the Town-mandated “One Town, One Budget” narrative that focuses on the overall tax rate increase, rather than just the school tax increase that we’re actually voting on. We hate it when our Town Councilors get upset. So you can imagine how pained we were to hear normally mild-mannered Councilor Donovan’s rather scathing commentary on the VOTE NO signs. He was appalled and outraged. He was particularly teed off by the YES and NO signs being placed next to each other, for reasons that aren’t clear to us. But we do agree with one of the Councilor’s comments: “You can’t trust people who would manipulate the public.” By pretending that there is only one budget, when there are in fact three budgets (school, municipal and county) that roll up into an overall tax rate, town leaders are attempting to distract voters from the 7.4% increase in the school tax. (Food for thought: think how much lower the overall tax rate might be if the school tax increase were up a mere 3 or 4%.) To view Councilor Donovan’s sign commentary, start at about 2:13:25 of the June 7 Council meeting video. And they wonder why “the trust issue” keeps on coming up in community dialogues. We hope you took full advantage of the opportunities offered by the Scarborough schools. We wish you much success in your future endeavors, whatever they may be. We were sorry to hear that Mike Turek and his wife Alex have decided to leave Scarborough, additional casualties of the ever-increasing tax burden. Mike was one of the founders of SMARTaxes back in the spring of 2014. He has been a steady and plain-spoken voice of reason and common-sense in the community. On numerous occasions he has championed fiscal responsibility and encouraged the Town Council and School Board to consider taxpayers’ ability to pay when approving school budgets. For three years now I have stood before the Council telling them of an ever increasing number of people who have approached me to tell me they are leaving Scarborough because of the taxes. None of them wanted to be named for a variety of reasons. The last time I addressed the Council the number was 22. Today it stands at 24. I am selling my house. I watch my 80+ year old neighbor fret annually as the budget cycle played out. She has given up a lot to stay in her home and still eat and pay for medicine. One widow told me there is too much month left at the end of the money. I am now 71. I do not want the same thing to happen to me or my wife. It is my opinion the School Board does not care. A School Board member once told me the Board does not answer to the public. She said the Board is a governing body, not a representative one. Just as a church is made up of people, not just the building in which services are held, so is a town. It is my opinion the BOE and Town Council have forgotten the town is made up of people. It is my sincere wish and hope that every School Board member who supported these drastic budgets without regard to taxpayers’ ability to pay, along with every Town Councilor who voted for them will one day suffer the same fate I am today. Please join us in thanking Mike for his extraordinary service to the Town and wishing him and his wife all the best in the future! And please say thank you in a very tangible way by going to Town Hall and voting NO on June 13. Well, that wraps it up except for one final reminder to vote at Town Hall on Tuesday, June 13, from 7am to 8pm. If you believe a 7.4% increase in taxes raised for the schools is too much, please VOTE NO. We had more material, but we have to end it here since duty calls – we have to go plant a few more of those “disrespectful” signs. This entry was posted in Uncategorized on June 12, 2017 by Site Author.